Just don’t do it. 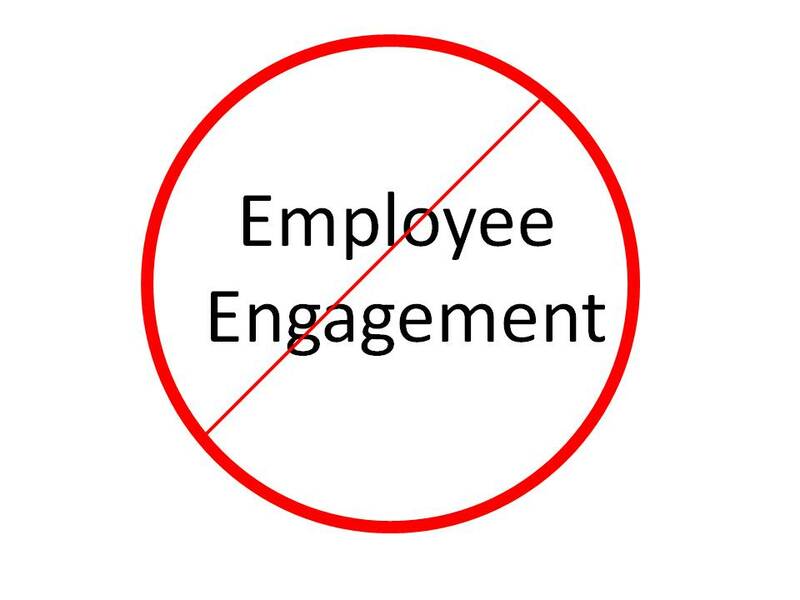 I believe many organizations and companies would be best served by doing nothing in regards to employee engagement. I believe this recommendation is startling at a site devoted to employee engagement and by someone who has devoted their focus to all things related to employee engagement. Let me explain this contradiction. Ready, willing, and able? Your organization does an engagement survey and you uncover or discover low engagement scores. Leadership is concerned and decides to improve the engagement scores by the next major survey. Before taking action, leadership needs to determine if they are ready, willing, and able to act on this desire. If they do not fully invest in employee engagement improvement they may actually be contributing to further disengagement. Do we believe we can change engagement in this organization? Do we have the will to improve engagement? Do we have the skill to improve engagement? Do we know the key variables to improve? Do we know how to improve these key variables. Will we allocate adequate resources (people, energy, money) to improving engagement? Will we integrate engagement work throughout the organization or will it reside only in HR or internal communications? Will engagement be an important line function? Will we adequately train our leaders, managers, supervisors, and staff to improve their own engagement and the engagement of others? Stop it. Here is the radical thought. If you or your organization are not ready to fully embrace what is required than perhaps you might be best served by not engaging in an engagement program. Radical non-intervention may at least prevent a further deterioration of engagement scores due to cynicism. A mediocre engagement initiative may result in more cynicism, tax limited energies, or create another flavor of the month organizational program that erodes decreasing levels of faith and trust in the organization. If. If you don’t see the compelling reason to improve engagement, if you are not ready, willing, or able to improve engagement, if you don’t have the capacity to make a significant difference, then let it go. Just do it (but do it right)! By the way, I hope you won’t do this. I hope you will fully engage in engagement work. Can we expect to reach full engagement of employees if we don’t fully engage in the very approaches, strategies, tactics, and tools we are using to create engagement? Coming soon. In future Tuesday posts I will outline the rationale, reasons, and requirements to successfully enhance employee engagement. Contact David Zinger. If you would like customized coaching, consulting, or training on employee engagement contact David Zinger today for a free consult. Click here to start or revitalize your employee engagement approach. Great points and I agree. If you’re not ready to walk the talk, stop make-believin’. There’s a lot to be said for transparency and for telling it like it is. That increases engagement. If employees aren’t really involved in the decisions and aren’t really able to influence changes, then don’t talk that talk. Actions are always speak louder than words and it’s easy to be a cynic when there’s no wood behind the arrows. I wish you many “wooden arrows.” We need to have clarity on what we do and recognition of what we need to say no to or stop doing. This is excellent, and timely too. We go through the motions….yawn! And right now we have (yet another) new boss. Think this will make a good pitch. Inspiring! All the best in being engaged without just talking or surveying about engagement and not having real weight or priority put behind the engagement process. I agree with the concepts, prior to my current role I was a VP at a large bank and we were very focused on survey’s and then having meetings to make an impact on the engagement levels. In large organizations it is very hard to turn things around if the overall culture is in trouble. I would agree that if you do not have it within your control to fundamentally change what is causing the issue then the high profile survey’s can add to the issue. I suggest that taking action based on your own understanding of the issue would have more impact than having a very high profile survey process. Thanks for you comment on this post. We can become myopic to engagement when we focus so closely on engagement surveys.